Our attention has been drawn to the libelous story posted on your website on 2nd June, 2013, on the Governor of the Central Bank of Nigeria (CBN), and which has now been circulated by other online websites and blogging groups. The post was full of fabrication and inaccuracies. Ordinarily this would have been best ignored. We are however constrained to write to you on account of the severe implications of the allegations for the integrity of the CBN, as an institution.It is also important to reaffirm our long-standing commitment to due process and international best practice in the discharge of every aspect of our statutory mandate. We wish to state that CBN is an equal opportunity employer, which prides itself with having female members of staff that possess the highest qualifications, competencies and skills. It is rather reprehensible for anyone to cast such aspersions on the qualifications and integrity of our female staff. That Dr. Maryam Yaro is a staff of the CBN at the level of Assistant Director and that she was recruited without due process, as she was not qualified for the role. That the CBN Governor introduced Dr. Yaro to the CBN and exerted pressure on the Human Resources Department to recruit her. 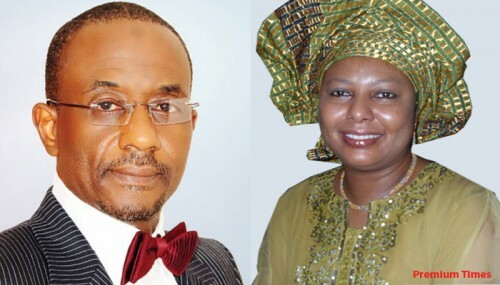 Dr. Maryam Yaro is not, and has never been an employee of the Central Bank of Nigeria. She was one of four consultants (three of whom were male), hired by the Nigeria Incentive-based Risk-sharing System for Agricultural Lending (NIRSAL) Plc; on a one year contract, renewable on the basis of satisfactory performance. NIRSAL Plc is a special purpose vehicle (SPV) set up by the Federal Government of Nigeria, through a partnership between the CBN and the Federal Ministry of Agriculture and Rural Development (FMARD). In the course of establishing NIRSAL, the Hon. Minister of State for Agriculture and Rural Development, through a formal letter, recommended Dr. Yaro to participate in the project as a Specialist on Rural Finance Access. Dr. Yaro was hired after a rigorous selection process conducted by the the NIRSAL Project Implementation Office. This clearly contradicts the claim that Dr. Yaro was brought in by the CBN Governor. Contrary to allegation that the Governor expedited recruitment of Dr. Yaro, the PIO’s recommendation to hire her as a Consultant, was written on March 30, 2012 but only received final approval on June 20, 2012. It is pertinent to add that Dr. Yaro’s academic qualifications and experience eminently qualify her for the job. She is a Doctor of Veterinary Medicine (DVM), who speaks three Nigerian languages, and has extensive experience working with farmers across the country on different agricultural programmes. She has also been a consultant to the Food and Agricultural Organization (FAO); and was one of the experts working in the National Programme on Food Security before she was engaged by NIRSAL. Please find attached, the relevant documents in support of the facts stated above and we hope you will give this the same publicity you gave your initial story. We have noted that the other allegations in the post border on the person of the CBN Governor and are consistent with previous attacks. In line with the Governor’s usual practice of not responding to these libelous comments on his person, we have decided not to respond. The CBN shall remain resolute in the pursuit of its statutory mandates regardless of any attempt to distract the institution or its officers. Reacting to the statement, , Premium Times Acting Managing Editor, Idris Akinbajo, said the paper is standing firmly by its story. “We knew the story was going to shock a lot of people. We were under no illusion that Nigerians would hurriedly swallow the bitter truth of the revelations made in the story. We have discharged our responsibility of providing information we believe citizens need to hold officials accountable. “Our job is done, as we will only continue to provide additional information as necessary. It is left for Nigerians to either demand accountability or live with, and celebrate the indiscretions of their leaders.